Intelligent design meets impeccable style with the 2-piece toilet from GLACIER BAY. Keep your water bill on the lower side with the single-flush system. Designed in classic white for a simple, yet classy look. The Cadence II combines graceful curves in a contemporary design that ensures a distinctive, sophisticated bathroom style. Naturally, the Cadence becomes the focal point of the bathroom, and its performance and water efficiency are equally notable. Plus, the skirted trapway facilitates cleaning, and installs easily over existing floorboards for remodeling. This Model is available in WHITE as Shown as well as in Balsa as C3170-06. 2-Piece Single-Flush Elongated Bowl Toilet in White Intelligent design meets impeccable style with the 2-piece toilet from GLACIER BAY. Keep your water bill on the lower side with the single-flush system. Designed in classic white for a simple, yet classy look. 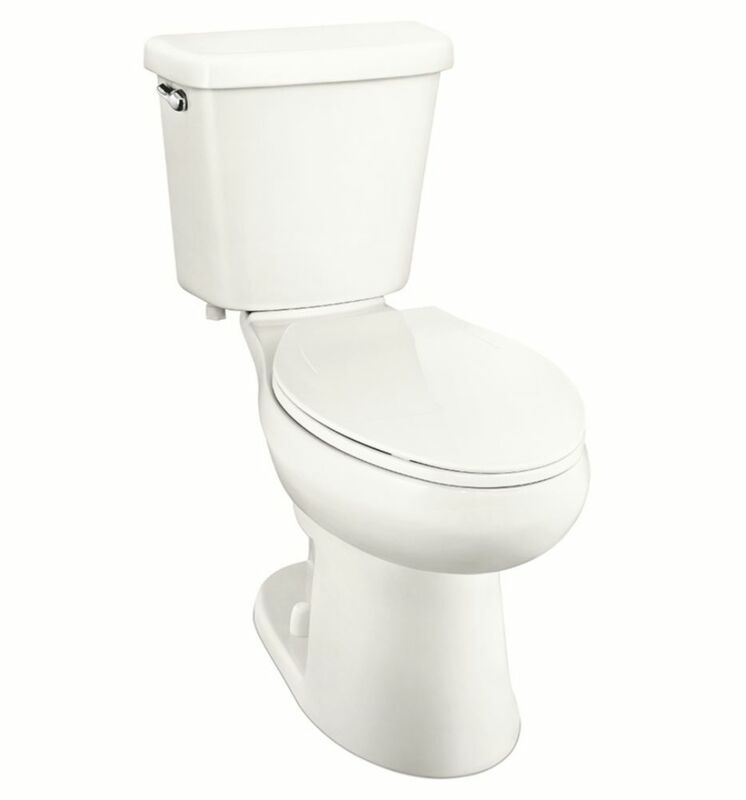 2-Piece Single-Flush Elongated Bowl Toilet in White is rated 2.8 out of 5 by 54. Rated 1 out of 5 by oldsoaker from Abysmal! Doesn't flush well at all. I should say, "didn't", because it was so bad I pulled it out... Abysmal! Doesn't flush well at all. I should say, "didn't", because it was so bad I pulled it out and replaced it today (I just installed it about 4 months ago). Both long-term and short-term cleaning issues. I've had a good experience with the American Standard Cadet 3 (chair height, elongated bowl) so far (about 3 months in a different bathroom). Rated 1 out of 5 by Ryan from Feces sticks to sides of bowl This toilet is garbage. there isn't enough flow to clean the bowl. Rated 1 out of 5 by SaraLee from This is absolutely THE WORST TOILET IN THE WORLD. It just does NOT flush properly and sometimes ... This is absolutely THE WORST TOILET IN THE WORLD. It just does NOT flush properly and sometimes takes 10 times of flushing to get all the stuff to go away. I even have a bidet attachment set up and even if I fill the toilet with more water, the actual power behind the flush is non-existent. I am UTTERLY disgusted with this product! Rated 1 out of 5 by Bigcountry from Frustrating New home purchase and wanted fresh new toilets. This toilet will not wash down the back of the bowl. It even pushes up from the bottom to the back of the bowl when flushing. If you buy, keep a cup of water for guests to wash their stuff off back of bowl. And wash daily to keep smell down. Rated 5 out of 5 by Ray from I am very impresed with the toilet. I have... I am very impresed with the toilet. I have a small apartment building and I plan to replace all of the 40 year old american standard stools with this water saving good looking stool.Thank you H D for stocking this. Rated 1 out of 5 by disappointed from This toilet is terrible! I will not flush material. Do not purchase this toilet! This toilet is terrible! I will not flush material. Do not purchase this toilet! Is the tank of this toilet protected from sweating through? Most toilets have a styrofoam type of liner but want to check before ordering. I looked inside the display model at the store and tank is not lined. However, there is a very similar model 1000822557 that is Glacier Bay, 3.8 l flush, elongated and has a lined tank. It is available in some stores. Price at this time for the 822557 is $149.